When I decided to join the Gluten Free for 30 day challenge with my gym, I didn’t do a great job at looking at my calendar ahead. With Saint Patrick’s Day (Goodbye Beer …. ), a weekend excursion to Washington D.C. and my first big dinner party at our house planned, I had my work cut out for me. But, I survived the month and managed to stay on track. The biggest accomplishment might have been creating a four course meal for my big dinner party that was entirely gluten free. I wanted to make the dinner “diet friendly” without making this detectable to the hungry men and women who didn’t share my eating constraints! Today’s recipe was a product of test kitchen tryouts and the desire to incorporate some seasonal flavors into the meal. I’ve made Ricotta Gnocchi in the past and they are shockingly easy. But, I was uncertain how making true potato gnocchi would fare. Especially, with using gluten free flour, which I have heard doesn’t quite have the dough forming qualities that regular flour does. Rather than start from scratch, I leaned on the Gluten Free Baking blog’s recipe (http://www.glutenfreebaking.com/how-to-make-gluten-free-gnocchi/). She did a great job doing the math for us on the flour to potato ratio. The only change up I made was that I used All-purpose gluten free flour instead of the white rice flour (it was what I had on hand). They ended up turning out great! One thing I would note for the gnocchi dough is that keeping a warm, damp cloth over the dough you aren’t using yet while you are working on rolling it out is important to keep moisture in it. 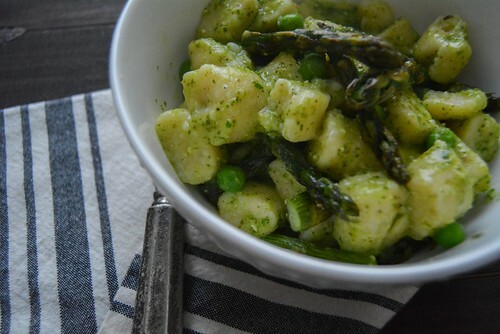 As for my gnocchi accompaniments, I love the pairing of pesto and crisp vegetables. The small bit of lemon zest I added in this pesto really shined through. And the peppery arugula combined with the bold cheese flavor and it was a great coupling. The pesto, pasta, and vegetables all tossed together makes this dish an Italian bowl of Spring comfort. The pesto and vegetables portion of this recipe are an easy pull-together meal. If you’re looking to skip the homemade pasta part, just sub in some good quality pre-made gnocchi or pasta. It will still end on a delicious note! If you’re in for the challenge, take on the dough. Once you learn the basics, it becomes an easy feat. 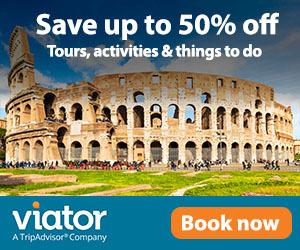 Check out these foodie discounts I am sharing! 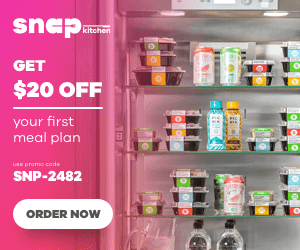 Get 3 FREE Family Plan Meals from Sun Basket! Fresh organic, non-GMO ingredients and kid-friendly recipes delivered! Preheat oven to 425 degrees. Wash, trim, and cut aspargus into 1 inch pieces. Toss with 2 tbsp oil and bake in the oven for 15 minutes. Meanwhile, Make pesto. Place arugula, pine nuts, shredded cheese, garlic, and lemon zest in a blender or food processor. Pulse while slowly pouring in the olive oil. Add salt and pepper to taste. The Pesto should look creamy. If it is still a little dry you can add a bit more olive oil and pulse. Place a large pot of salted water over high on stovetop. Bring to a boil. Bring a separate small pot of salted water to boil. Add the peas and allow to cook for 2 minutes. Drain and set aside. Place the peas and asparagus in a large deep skillet pan over medium heat with remaining oil (approx 2 tbsp). Add pesto. Carefully add the gnocchi to the boiling large pot of water. Cooking until floating on the top and remove with a slotted spoon and add to the skillet. Once all gnocchi are removed, take 1/2 cup of the starchy pasta water and add it to the skillet. Toss all ingredients together. Thank you! It’s very tasty, hope you enjoy.